It's fun on the farm with Barney! 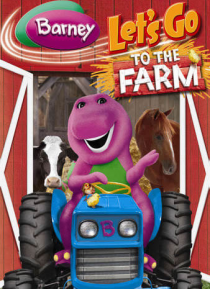 Come join Barney, Baby Bop(TM) and BJ(TM) as they take their friends on a fun-filled adventure to a farm. They meet and play with baby animals, take a pony ride and learn all about farm-fresh fruits and veggies! They also explore the barn and enjoy fresh air and sunshine while singing their favorite songs. The day ends with some homemade ice cream and a big, farm-… tastic barn dance.